As President & CEO of Genomic Health, Kim Popovits has led the company in revolutionizing the treatment of cancer through genomic-based diagnostic tests that address the overtreatment and optimal treatment of early-stage cancer, one of the greatest issues in health care today. Kim also serves as Chairman of the Board and joined in 2002 as COO. Over her 15 years at Genentech, Kim led the successful commercialization of 14 new therapies. Earlier, Kim served as division manager for American Critical Care. 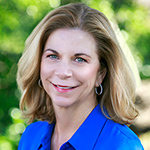 Kim currently serves on the boards of California Life Sciences Association, Personalized Medicine Coalition, American Clinical Laboratory Association, and ZS Pharma and is also President of The Coalition for 21st Century Medicine & Advisor to the Health care Businesswomen’s Association. Awards recognizing Kim’s contributions include: Most Admired CEO 2014, SF Business Times’ Most Influential Women 2006-12, and Women Health Care Executives’ Woman of the Year 2008. Kim holds a BA in Business from Michigan State University.